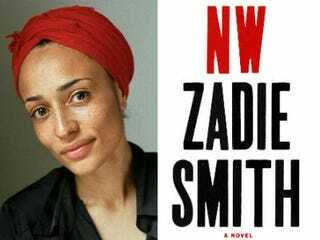 (The Root) — Ever since her praiseworthy debut, White Teeth, at the turn of the century, British writer Zadie Smith, 36, has been lauded for her keen view of modern-day multicultural London and her ear for witty, multigenerational dialogue. Faithful readers of Smith's subsequent titles, The Autograph Man (2002), On Beauty (2005) and her latest novel, NW, show up for entertaining prose cut with a literary scholar's attention to compelling characters and the playfulness of a postmodern stylist. NW traces the evolving relations between childhood girlfriends Keisha Blake and Leah Hanwell — 30-something Brits of Jamaican and Irish ancestry, respectively — born and raised once upon a time in the fictional council estate (i.e., housing project) of Caldwell, in Northwest London. Keisha marries up, becoming a barrister struggling with a lifelong crisis of self-identity; Leah stays in the hood with her French-African hairstylist husband, harboring more than a little class-envy resentment against her old friend. Like some Spielbergian director who balances mainstream classics with more personal exercises in her own creative abilities, Smith has faced mild disapproval of NW from critics expecting something along the slightly more conventional lines of On Beauty. But as the admittedly "thin-skinned" novelist told The Root recently, she only respects evaluations of her work that are "intelligent" rather than "spiteful." Currently a professor of creative writing at New York University, Smith, mother to daughter Katherine, spoke to The Root about lit criticism, her writing process and the ever-changing landscape of London. The Root: NW has arrived seven years after On Beauty. How do you organize your writing time nowadays, given the changes in your life since then (i.e., motherhood)? Zadie Smith: The standard answer to this is, "I organize my time much more effectively," but I'm afraid that was only an early reaction to changed circumstances, and as time has gone on, I've reverted back into my old, bad habits. The difference is, these days when I waste four hours looking at women's dresses on the Internet, I am painfully aware that I'm a) doing this instead of looking after my child, b) doing this when I should be writing or marking essays (which was always true) and c) paying good money to buy the wasted time (which was not always true). So it's like standard-issue writer's guilt, but multiplied by a million! The bottom line is I have much less time to write, yet sadly this does not always compel me to work efficiently. Sometimes it does, but not always. TR: When you read recently at a Barnes & Noble store in Manhattan's Union Square, they introduced you as being more proud of NW than any other book you've written. Is that true? ZS: Oh, people are always proudest of the books they just wrote. The feeling passes. But I guess part of it is the sense I had of writing as an adult instead of a very young person; of writing perhaps a little more honestly than I have in the past; and of being in control of my effects. I wanted to write a black existentialist novel, told in separate parts, that replicated some feelings I have had about being alive. I wanted each section to create a completely different sensation, because I don't find life to be seamless. I knew it wouldn't be as pleasant as On Beauty, but that book is a comic fantasy, and I wanted this book to be a sort of problem-play about things as they are, not as I would dream them to be. When I finished I felt I had done a lot of what I set out to do, and that's the only real satisfaction you can get from writing. TR: How do you deal with mixed reviews? ZS: An intelligent review is never too depressing, even if it's bad; it's the uncomprehending or spiteful ones that hurt. I can remember receiving a letter from David Foster Wallace a long time ago in which he mentioned how hurt he was by the reviews of his work in the New York Times. After he died, I was writing an essay about him, and so I looked back on those reviews and wrote about them, too. It wasn't just that they were bad, in both senses; it's that they were totally uncomprehending of what he was even attempting to do. And that's the worst kind of review. Of course, in his case the past got rewritten: After he died the same reviewers were keen to assure us that they had always thought the man a genius. But the truth is throughout his career all he received were mixed and patronizing reviews. It was the readers who understood the work and what it was attempting. For myself, I'm just as thin-skinned as the next writer … the critique has to come to the book on its own terms. Just saying, "I prefer a plain story plainly told" — as if anything that deviates from some completely arbitrary idea of "plain" is a crime in itself — well, you can't win with those folks. TR: What shifts in multicultural London have you seen since writing White Teeth? ZS: I'm not the best person to ask — I've been away from home for the better part of 10 years. I'm back in the summers. One summer there's a royal wedding; one summer there's a riot; the next summer, the Olympics. It's hard to generalize. But I guess I don't think of the city as "multicultural London" any more than I walk into my mother's flat and think, "Ah, there she is, my black mother surrounded by her multicultural family." I don't see it as a coherent entity that is in development or shifting. It's a trap for nonwhite people to consider themselves as a sort of sociological experiment or the basis of a political debate. We are people; we exist. The changes I see in London are almost wholly economic, and it is into this changing economic landscape that people of many colors must try to exist and survive. And it's the same change you see everywhere. The rich are richer and the poor poorer. Miles Marshall Lewis is the Harlem-based author of Scars of the Soul Are Why Kids Wear Bandages When They Don't Have Bruises, There's a Riot Goin' On and Irrésistible. Lewis is a former editor at Vibe, XXL and BET.com. Follow him on Twitter and visit his personal blog, Furthermucker.